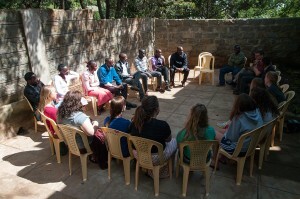 Today was a relaxing day for our Kenya team. We headed out bright and early to Nairobi and made our first stop at the Sheldrick Elephant Orphanage. 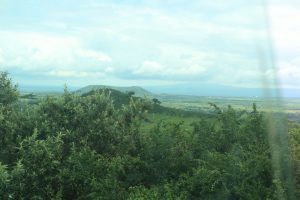 When we arrived there it was surprising to see mainly tourists and very few Kenyans. I guess this means we are becoming more accustomed to being here! The baby elephants were adorable and it was far better then any zoo you could possibly go to. There was a roped in area in which they brought the baby elephants and they fed them bottled milk and in which we could watch them play in the mud. We were even able to pet them. The youngest baby was only about a month old and they ranged in size and ages. Most were orphaned due to their parents being poached for ivory. This center rescues orphaned or injured elephants and tries to preserve the species. Our next stop was the Giraffe Center. This is a place where they are working to preserve a variety of giraffe that is endangered. Walking up to these creatures was amazing; they are beautiful and unique creatures. To be that close to them was such an experience and definitely one of the highlights of the day. There was a two-story building with a wrap-around porch where we could feed the giraffes treats. 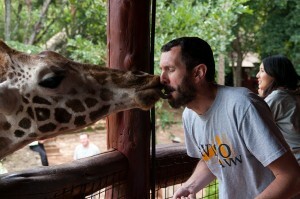 This is where the fun began; Patty was the first to dare to kiss the giraffe. Soon, though, most of us had. Us girls preferred to kiss Eddie—he was just too hard to resist. We all later agreed he was definitely the best kisser among the giraffes. I think he had the most practice. Dr. Dixon, however, reserved his kiss for the very ladylike Daisy, who also was tempted to eat our treats. We shared lots of laughs and have many pictures to capture the memories. The rest of the afternoon we spent at a shopping mall. It was surprising how different parts of the city can be. The mall felt almost American and it was hard to believe that we were still in Kenya, just a short drive away from poverty. It was a blessing to be so close to, and experience the beauty of God’s creation today. I know that is something we will remember the rest of our lives. Each day that I am here I see the extent of His amazing creation in the land and in the Kenyan people. I'm not even a little surprised that Patty initiated the giraffe kissing. Obviously, she misses her dogs. 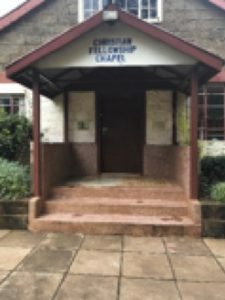 Glad to hear all that Christ is doing in Kenya and in you all! Love you guys! We are excited for you learning so many new experiences and having this opportunity to make a difference in the world for the glory of the kingdom. We love you and miss you Eve.